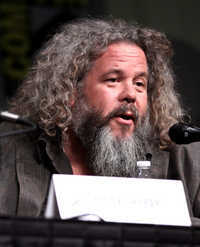 Mark Boone Junior (born Mark Heidrich; March 17, 1955) is an American actor, best known for his roles as Bobby Munson in FX's Sons of Anarchy and in two films by Christopher Nolan, Memento and Batman Begins. This webpage uses material from the Wikipedia article "Mark_Boone_Junior" and is licensed under the GNU Free Documentation License. Reality TV World is not responsible for any errors or omissions the Wikipedia article may contain.